I clipped a few things from my parent’s yard and took them up to Boston with me for the week as a reminder of the lushness of spring in Pennsylvania. 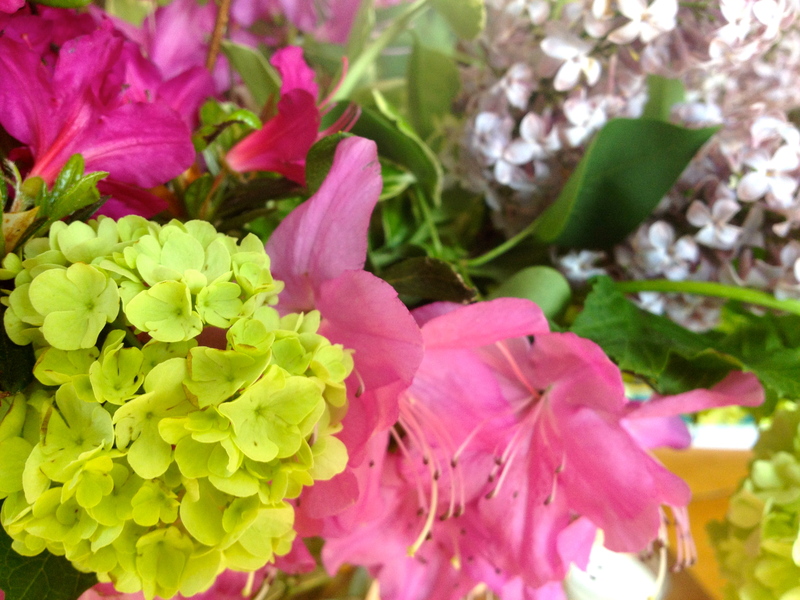 This is what I ended up doing with them, keeping clusters of azalea, lilac, and snowball viburnum grouped together. These pics were taken before I got my new camera, unfortunately. More delicious plant and flower photos to come as the week progresses. I didn’t do anything fancy with the stems (like pound them or slit them vertically,) I just cut them with sharp pruners on a slant – and because there was a lot of woody material, they stayed in place pretty well. These didn’t last as long as I would have hoped – only 4 days or so. The lilacs crisped up first. I should have let them condition in a cool dark place with hot water for an hour, then added cool water and let them sit for 4-5 hours (like my teacher Jane taught us during Day 3 of Basic Floral Design!) 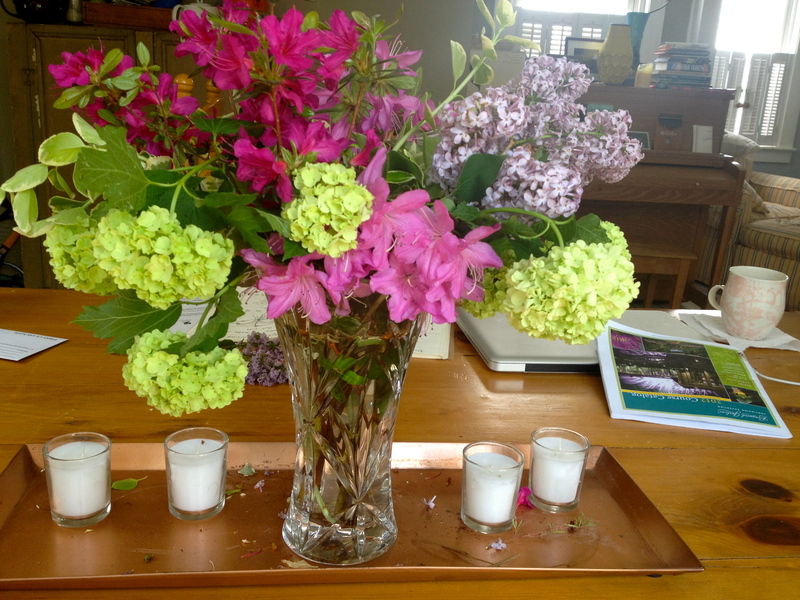 Instead, I cut them, put them right in a bucket of cold water, and drove 5+ hours with them, letting the lilac scent permeate my brain deliciously. Upon returning to Swarthmore, where these shrubs live, I see I will be given another chance to work with these dazzling spring blooms – but I’ve missed out on the chartreuse phase of the Viburnum – it’s already turned white! 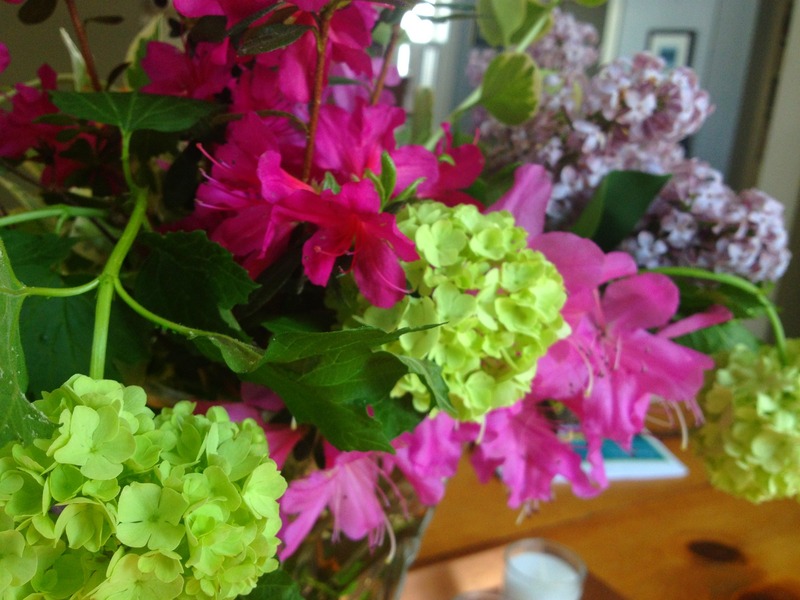 This entry was posted in Floral Design, Flowers, Shrubs, Spring Blooms, Swarthmore and tagged Arranging with Shrubs, Azalea, Lilac, Snowball Viburnum, Spring Arrangement, Viburnum macrocephalum by Ann. Bookmark the permalink.